I'm a huge fan of the world Cassandra Clare has built in her Mortal Instruments series. The Shadowhunters and everything she created around them fascinates to me. And so when I heard she wrote a prequel, set in Victorian England (one of my favorite settings), I knew I had to read it. It was so awesome--detailed, tense, emotion-filled. The one criticism I have heard about the book is that Jace (a character from the first series) and Will (a character from this one) are interchangeable. I would agree--they are similar. But, since I loved Jace (LOVED him), I was perfectly fine with an old-fashioned version of him. So bring on the rest of series, I'm ready. "Magic is dangerous--but love is more dangerous still. 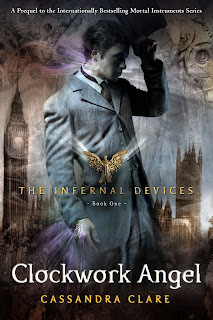 Friendless and hunted, Tessa takes refuge with the Shadowhunters of the London Institute, who swear to find her brother if she will use her power to help them. She soon finds herself fascinated by--and torn between--two best friends: James, whose fragile beauty hides a deadly secret, and blue-eyed Will, whose caustic wit and volatile moods keep everyone in his life at arm's length...everyone, that is, but Tessa. As their search draws them deep into the heart of an arcane plot that threatens to destroy the Shadowhunters, Tessa realizes that she may need to choose between saving her brother and helping her new friends save the world...and that love may be the most dangerous magic of all." I've been looking for a good series to read...these are that good? I've seen others, I've started read a few in the stores; just to come home and read reviews. Yes. They're great. Start with the series that's already all out though, don't start with this series. The first one is The City of Bones. I loved them. That sounds like pretty great world building! I'll have to check it out. I still haven't finished it! I must go buy it! I recently read City of Bones and enjoyed it a lot more than I thought I would. I'm going to continue with that series and check out this one. I love that time period, too.